From the quality of our materials and care in our craftsmanship to our immaculate installations, our customers have already put their trust in New Forest Oak Buildings. Oak framed barns and buildings seem to exude an aura of calmness and well being; they have a character all of their own. This is because every oak element has been selected, sawn, and put together using traditional craft based construction methods which have changed little over centuries. The nature of traditional oak frame design and the recurrence of vertical oak bays, gives flexibility in internal design layout which is particularly suited to contemporary open plan living. It also allows large glazed panels to be interspersed without structural weakness and lends itself to stainless steel detailing and other crisp engineering references. 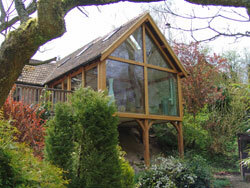 As you can see an oak framed extension can really turn ‘run of the mill’ into ‘Grand Design’.This large living room extension stands on oak ‘stilts’ and has wonderful views through massive glazed panels to the lush woodland garden beyond. New Forest Oak Buildings can provide you with a high quality oak framed structure as a turn key product or as a kit of parts. Please contact us for sound & friendly advice at an early stage of your project.